As I prepare the liturgy for the Third Sunday in Advent, various interpretations and musical settings of the Magnificat litter my office. Over and over again, the words placed on the lips of the young child Mary who was “great with child,” a child in whom our hopes and dreams for a new kin-dom of justice are embodied, sing in my imagination. In these past few days, I have observed my Canadian sisters and brothers as we look with horror and sadness as news of what look to us like travesties of justice steam across the border. As Canadians we comfort ourselves with the delusion that the kind of racism which results in what appears to be a systemic contempt for the lives of young black men does not exist here in Canada. We shake our heads in disbelief as grand-juries refuse to indite police officers in Ferguson and New York trusting that our own justice system would do a better job of seeking justice. Some of us go as far as offering up a prayer of sorts giving thanks that we live up here and not down there. Up here we believe that we are above the kind of racism that results in systemic contempt for the lives of so many simply because of the colour of their skin. No sooner than my lament leaves my lips, I comfort myself with the thought that I don’t live down there in the U.S., and like so many Canadians, I am more than willing to leave the fate of my American cousins in God’s hands, for there is nothing I can do; thank God. I can happily go about my day, smug in my country’s belief that we are not like “them.” So, with Mary “My soul magnifies the Lord, and my spirit rejoices in God my Saviour,” as images of Canadians, black, white, brown, and yellow dance in my head as equal before the law. Even as I sing to myself my favourite rendition of the Magnificat, images begin to creep into my head; images that cause the tears to return, images of stolen sisters, and the “Highway of Tears” bridges the gap between my delusions and reality. 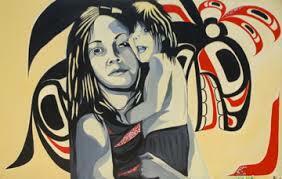 Missing and murdered aboriginal women and girls cry out for justice while the rich and the powerful, the movers and the shakers refuse to listen and Canadians go about our business as if justice will somehow happen without our concerted efforts. The statistics are devastating (read them here), testifying to our indifference. Yet, we continue to delude ourselves with opinions about our inclusive just society that cannot be reconciled with the mounting numbers of lives lost and our justice system’s failures. The statistics along shout out that we, “enlightened” Canadians place a lesser value on the lives of aboriginal women and girls. How else can we explain the lack of justice for all? While some of us lament and others offer prayers, the God to whom we lament and pray appears absent; lulled into inactivity by our complacency. For if God dwells among us, if we are God’s hands, if incarnation truly means we are the body of Christ, then Mary’s cry is to us! We have work to do! We are the justice-makers! We must begin in our very selves. For just as surely as we are divine, we are also human! Our own humanity is incomplete as long as we let our own inherent racism go unchecked. Until every life matters to all of us humanity will remain broken and justice will be denied. It is up to us “the powerful” to relinquish our “thrones” so that “the lowly” can be raised up. Don’t misunderstand, I am not suggesting that aboriginal women and girls are “the lowly”. I am insisting that we, the powerful are intact lowly. As long as we fail to live into our full humanity we are both the high and mighty responsible for the systems which ignore the plight of our sisters and yes our brothers. As long as we fail to live into our full humanity we are the lowly, deluding ourselves with false comforts and failing to see our own diseased racism. We have work to do! We have justice to ensure! We have women and girls to find and mourn. We have families to restore and amends to make. Lessons to learn. Systems to tear down and rebuild. God dwells in, with, through, and beyond us. God breathes in, with, through, and beyond us. Mary’s song cries out for justice. Our American black cousins cries out for justice. Our aboriginal sisters cry out for justice. God will show strength in, with, through, and beyond us. God will bring down the powerful from their thrones, lift up the lowly, fill the hungry, and send the rich away empty in, with, through, and beyond us. We have work to do! This entry was posted in Evolutionary Christianity, Progressive Theology, SERMONS and tagged Advent reflection, Lutheran sermon Advent 3B, Lutheran sermon Luke 1:39-56, magnificat, missing and murdered aboriginal women, progressive Christian sermon Advent 3B, progressive Christian sermon Luke 1:39-56, religion, theology by Rev. Dawn Hutchings. Bookmark the permalink. Excellent Advent Commentary. It speaks to and for me.